How to grow hydro: 10 rules of thumb on watering plants. 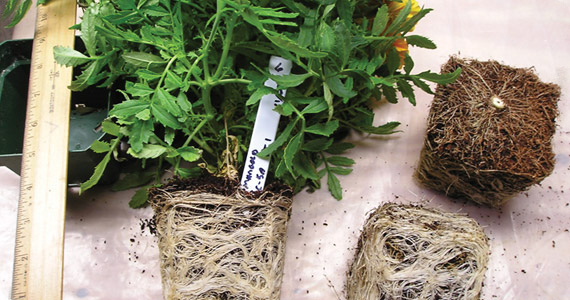 To begin, herbaceous root systems require near 100% humidity, ideally, at all times, otherwise the root tips die back. The root tip is the very small end of the root that is divided into 3 zones. This tip is responsible for the taking up of the vast majority of minerals and water. Root hairs facilitate this uptake and occur in the last or third zone. After the third zone the root tissue begins to lignify and become more impervious to water and nutrients. Kill the tips and the root has to regenerate one before going forward. Roots grow in response to depletion zones, or areas where the root has absorbed all the minerals and water located there. When the material is not replaced, the root extends to find more. Roots have to grow. When nutrients and water are abundant, the root system does not develop in balance with the shoots and a carbohydrate limited condition presents itself weakening the plant. Allow the plants time to dry and thus use up the minerals present. Conversely, hold them too dry and a condition known as chronic underwater or underfeed can manifest. The root tips will also die back limiting further plant development (Fig. 1). Well drained medium can have water applied for a longer period (ON time) because the excess drains quickly from the medium when the application ceases. 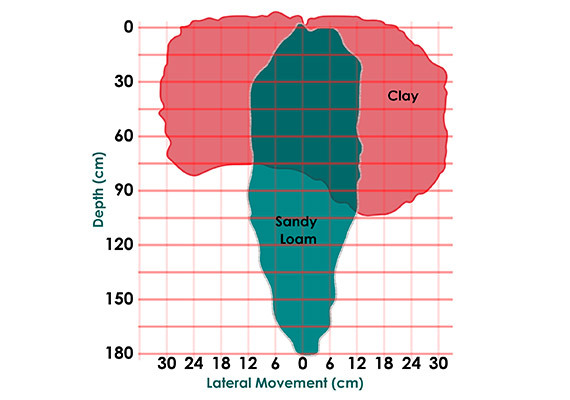 Poor drained mediums have much shorter application time (but application rate has to be slower for absorption) because it will take longer to drain the excess water away from the root surface. Very poorly drained mediums are impossible because the rate of application has to be slow to absorb and with the drainage time, can never be watered throughout (Fig. 2). The general rule of thumb for determining the root health and irrigation needs of a system is that 1 square meter of bench top, covered with leaves, will use 4-6 liters of water a day. New plants, or where the square meter is not covered totally with leaves, will use about 3 liters a day on average. This is true whether there are 2 plants or 20 in the square meter. Build the system to be able to supply this amount across each watering and for however long you want to go without mixing more. 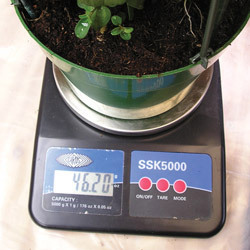 Use this figure to decide how well the plants are working. If it is using less, either the roots are having a tough go, the humidity could be too high, the temperature could be too low, and so on. air currents; and so on. Above all else, keep the crops developing equally. With organic or inert medium, water when 50% of the water you applied last time is gone. 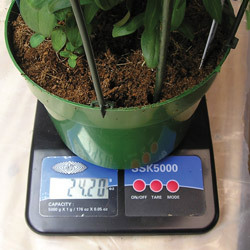 In some instances, the grower can weigh the container bone dry, water to drainage and weigh again. The difference is how much water the container will hold. In aeroponic systems, you have to be good at judging when the root surface has just lost the free moisture on it while not falling much below 100% humidity (air). This will require constant monitoring especially where the roots are exposed to free air. Roots like the dark and really try to grow away from light. Keep them as lightless as possible in systems that are thin walled PVC, or an air chamber. Remember, in a container with medium and drainage holes, you cannot put in too much water, just too long an application. For example; a 5 gallon pot can have 3 gallons applied in 5 minutes or 20 gallons (if the medium does not flush away) but there will be the same amount left in the container ten minutes after stopping the application. Cycles have to be adjusted during the dark period of the lighting cycle because the plant is using much less water. The dark cycle is critical to plant development. This holds true for cloudy days or high humidity periods. Media that holds water (peat, rock wool, etc), seldom if ever need watering during the night as long as the grower adjusts the irrigation cycle to water in the last half hour of light or first half hour. Want to know more about Hydroponics?